WestJet’s decision to push into new, less-dense domestic Canadian markets through the establishment of a new regional subsidiary reflects the 16-year-old carrier’s maturity in markets served by its Boeing 737 narrowbodies, but also shows a certain agility WestJet enjoys that allows it to execute new strategies quickly. 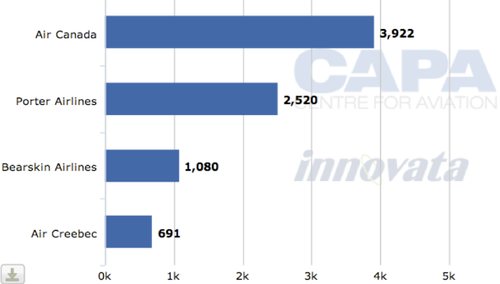 The carrier exhibited that agility last year when it bolstered its presence in the highly competitive Canadian eastern triangle (Toronto-Montreal-Ottawa) to build up its base of higher-yield business travellers and intensify competition with Air Canada and Porter Airlines. But WestJet’s decision to add a second fleet type to penetrate markets not viable for its fleet of 737s also reflects the realities of the Canadian commercial air transport market, the finite possibilities of exclusively operating narrowbodies and the genuine opportunities for higher-margin regional flying. Tapping what it deems as underserved markets is the next logical step for WestJet as the number of Canadian domestic markets it serves has leveled off during the last four years to around 30 destinations. 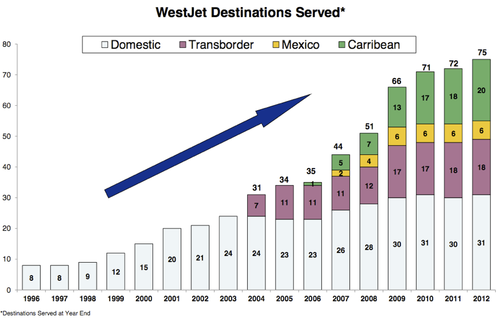 As its transborder and flights to the Caribbean start to enter maturity WestJet needs to find new avenues for growth, and the carrier believes it can transfer its low-cost strategy to an operation of 40 70-seat turboprops from bases in Calgary and Toronto. WestJet cites at least 30 cities in the Canadian domestic market that are too small to support its 737s where it estimates roundtrip fares on stage lengths of one hour can reach roughly USD1200. The carrier has not unveiled specific markets it plans to target, but WestJet CEO Gregg Sarestsky has been quoted in the local Canadian press giving examples of some cities that could benefit from expanded service including Cranbrook, Prince Rupert, Fort Saint John, and Dawson Creek in British Colombia; Lethbridge, Alberta; Brandon and Thompson in Manitoba; Saguenay, Quebec and Sudbury, Sarnia and Timmins in Ontario. Brandon’s lobbying effort has reportedly included the penning of a WestJet song to lure the carrier to the airport. 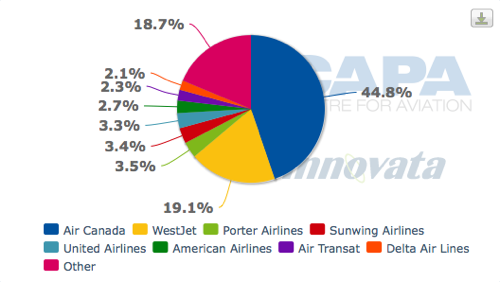 Brandon is currently not served by Air Canada’s regional partners, according to CAPA and Innovata data. Brandon is served by Perimeter Airlines with 16-seat Fairchild Swearingen Metroliners. Perimeter also serves Thompson, where Calm Air serves Winnipeg and Manitoba’s Churchill Metropolitan Area Airport. Perimeter, Calm Air and Bearskin Airlines are subsidiaries of the Exchange Income Corporation. Dawson Creek is also only served by a single carrier, Central Mountain Air, who along with Air Canada serves Fort Saint John. Central Mountain Air flies from Fort Saint John to Edmonton, Fort Nelson and Prince George using combination of Beech 1900 and Fairchild Dornier 328-100 turboprops. Fares at some the airports Mr Saretsky cited as examples of potential regional markets range from USD163 to nearly USD780. Airports featured in that list where Air Canada has monopoly include Lethbridge and Sarnia. Air Canada only offers flights to Calgary to Lethbridge, and a ticket from Calgary to the airport on 26-Mar-2012 ranges from USD164 for its non-refundable 'Tango' fare class to USD544 for a refundable 'Latitude' fare. Five flights are listed in the schedule, with three operated by Air Canada partner Air Georgian with Beech 1900 turboprops and two flown by Air Canada Jazz with 37-seat Bombardier Dash 8 100s. Flights returning to Calgary on 28-Mar-2012 have a fare range of USD153 to USD533 on a total of four flights – three on Air Georgian and single flight flown by Jazz with the Dash 8 100. Air Canada only offers direct flights from Sarnia to Toronto. Tickets from Toronto to Sarina for an outbound flight on 26-Mar-2012 currently range from USD287 to USD717 on a schedule of four flights operated by Air Georgian. Fares on a return leg for travel on 28-Mar-2012 range from USD287 to USD711. Timmins is already served by Air Canada, Porter, Bearskin and Air Creebec. Air Canada and Porter only operate to Toronto while Air Creebec offers flights to Moosoonee and Fort Albany. Bearskin serves Sudbury and Kapukasing. 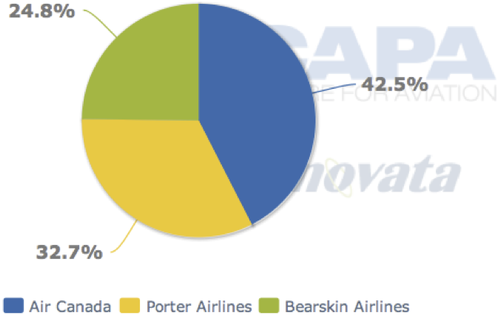 Air Canada accounts for 47.8% of the total 8213 weekly seats from Timmins, while Porter’s share is 30.6%. Air Canada, Porter and Bearskin also serve Sudbury, with Air Canada and Porter offering flights to Toronto. Bearskin serves North Bay, Ottawa and Sault Ste Marie from Sudbury. Air Canada also accounts for the majority of seats at Sudbury, but Bearskin offers the second largest number of seats from the airport, offering direct flights to North Bay, Ottawa, Sault Ste Marie, and Timmins. From Toronto City Airport to Timmins for a flight departing 26-Mar-2012 Porter charges a range of USD241 to USD466 on three flights flown with Bombardier Q400s. Fares on the return three flights on 28-Mar-2012 range from USD169 to USD443. Porter offers three fare classes with the most expensive fares offering a waiver of change fees. Air Canada Jazz operates 37 and 70-seat turboprops on six flights from Toronto to Timmins during the same travel dates, with fares ranging from USD243 to USD830 to Timmins and USD173 to USD783 on the six flights options for the return trip on 28-Mar-2012. Porter’s flights from Toronto to Sudbury for a 26-Mar-2012 departure range from USD278 to USD502 on four daily flights. Fares on a return trip from Sudbury on 28-Mar-2012 range from USD198 to USD473. Air Canada’s flights on the same dates range from USD278 to USD808 on the Toronto-Subury pairing and fall between USD201 to USD780 on the return from Sudbury. Jazz offers six flights in each direction with 37 and 70-seat turboprops. Bearskin operates mainly 19-seat Fairchild Metroliners from Timmins and Sudbury. Flights on Bearskin from Timmins to Sudbury for travel on 26-Mar-2012 and a 28-Mar-2012 return are listed at USD328 each way. On service from Timmins to Kapuskasing the fare is USD222 from Timmins and USD154 on the return from Kapuskasing. The carrier’s flights from Sudbury to North Bay for travel during the same time are USD294 on the departing and return flight. Flights to Ottawa are listed at USD315 and USD352 for the return. Bearskin’s offerings to Sault Ste Marie from Sudbury are priced from USD360 to USD587 and from USD330 to USD428 for the return trip. WestJet has also alluded to offering short-haul flights in transborder markets on its new regional carrier, which obviously has gotten the attention of Air Canada’s largest regional partner Jazz Aviation. Officials from Jazz have stated the regional is obviously watching WestJet’s development very carefully while Air Canada’s management has described WestJet as a formidable competitor. Jazz management has argued the 125 aircraft it operates on behalf of Air Canada under a capacity purchase agreement allows Jazz and Air Canada to efficiently serve numerous markets, noting its fleet of 70-seat Q400s and Bombardier CRJ705s, 50-seat CRJ100/200s and Dash 8 300 turboprops and the 37-seat Dash 8 100s allow Jazz a certain flexibility of aircraft size. With WestJet planning to operate just 40 70-seat turboprops, Jazz believes some difference in mission and network between Air Canada and WestJet’s regional operations will emerge. Porter Airlines could also see more competition in its transborder markets as well after proving the 70-seat Bombardier Q400 effectively serves Chicago, Boston, New York, Washington, DC, Myrtle Beach and Burlington, Vermont. WestJet has sent a request for proposals to Canadian airframer Bombardier and French manufacturer ATR as it evaluates the Q400 and ATR 72-600. Both Jazz and Porter already compete on flights to Boston, Chicago, New York and Washington. Taking a snapshot of fares using a 26-Mar-2012 departure and 28-Mar-2012 return on Toronto-Boston, Porter from the Toronto City Airport offers outgoing flights ranging from USD432 to USD538 and a range of USD196 to USD482 on the return flights. Air Canada direct flights from Toronto Pearson to Boston for the same travel period range from USD437 to USD1847 for service departing from Toronto USD193 to USD1795 on flights returning from Boston. WestJet sits in the enviable position of being the largest carrier in Canada not aligned with any of the three major global airline groupings – oneworld, Star Alliance and SkyTeam. 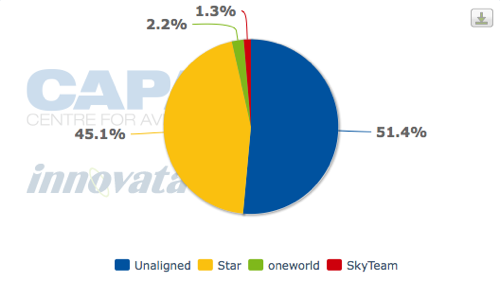 Air Canada’s long-time membership in the Star Alliance gives the grouping a 52.4% share of seat capacity in Canada. Over the years WestJet has enjoyed its unaligned status and quickly moved to grow its interline agreements to 17 and create five codeshare deals with American, Cathay Pacific, KLM, Japan Airlines and Delta Air Lines. WestJet’s plans to base the new regional subsidiary in Calgary and Toronto could allow its partners deeper penetration into Canada and access to more revenue from the Canadian market once the new airline launches. At Calgary, WestJet is the leading carrier in terms of weekly seat offerings, and the airport is not totally dominated by the Star Alliance. 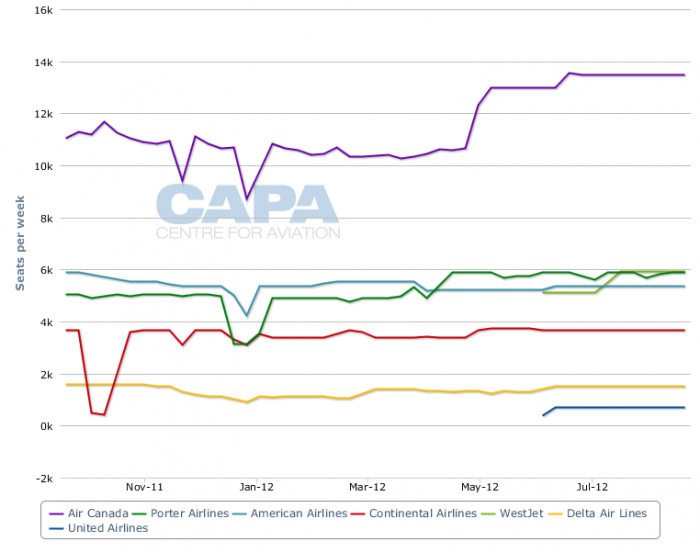 WestJet could see added revenue benefit from new and existing codeshares as it expands into smaller markets. Its codeshare with Delta already covers seven destinations from Calgary – Las Vegas, Kelowna, Regina, Vancouver, Winnipeg, Saskatoon and Victoria. Both carriers would also benefit from revenue share on the New York-Toronto pairing and WestJet’s new regional flights beyond Toronto. WestJet is stepping up competition in the busy Toronto-New York market with the launch of eight daily flights operated with 737s to New York LaGuardia Airport in June, which will connect with flights offered by Delta’s newly-minted stronger position from LaGuardia through a codeshare deal forged by the two carriers. Delta recently secured 132 slot pairs at LaGuardia through a slot swap deal with US Airways. In less than three months, WestJet was able to table plans for a new low-cost carrier and win employee endorsement to create the new subsidiary. It now plans to place an aircraft order with either ATR or Bombardier by mid-year with a target launch for the new carrier in 2013. It is a stark contrast from the year-long efforts by WestJet’s rival Air Canada to gain approval for the creation of a new LCC. Pilots rejected a tentative deal last year which had a letter outlining the LCC attached, and Air Canada CEO Calin Rovinescu has recently said the carrier’s desire to participate in the low-cost sector was proving contentious among its labour groups. During the last few weeks, negotiations between Air Canada and its pilots and mechanics have intensified and the Canadian Government has stepped in to halt any work stoppages by those groups. WestJet's planned new carrier is about growth, whereas it remains to be seen if Air Canada's new LCC will take over existing Air Canada flights, requiring Air Canada pilots to join the LCC, likely on less favorable employment contracts. WestJet is also moving forward with the establishment of a low-cost subsidiary as Air Canada has recently admitted it is seeing pressure on its domestic yields. While the speed in which WestJet moved to start developing its new regional subsidiary is impressive, the reality is the carrier has been looking at its options for expanding into smaller markets for years as it clearly understood it would eventually need to serve smaller markets to expand its revenue base. As it works to meet its targeted 2013 launch, WestJet’s execution of its regional strategy will come under intense scrutiny. It is possible the climb in oil prices and the uncertainty that places over demand patterns could make the proposition less attractive to WestJet. But for now WestJet is using a familiar strategy as it moves into the unfamiliar territory of regional operations – use low fares to stimulate demand and steal traffic.